As I boarded the ship, I reminded myself, "OK now, let's be judicious. Don't overeat!" But how could you not?! Look at all this just from Windjammer alone! My resolve stood no chance against the gorgeous array of food. In no time at all, I had had two lunches, tea-time snacks and two dinners. Those last words about not overeating? All chewed up and gone with the wind. 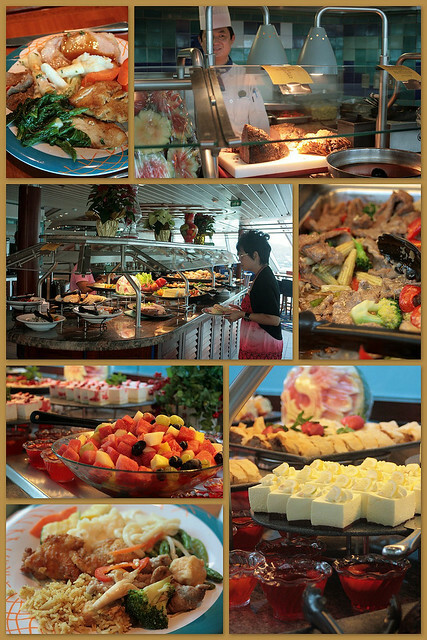 But I was comforted by Twitter replies telling me the whole point of a cruise IS to overeat! Decadent feasting, ahoy! One of the reasons I ate so many times was because it was with different people (we came on board at separate timings, as some had work commitments). Well, it's nice to have many friends on board to dine with. Here's my food blogger buddy Keropokman. As you know, his long-hidden identity has been exposed, what with so many bloggers taking photos of him and with him. Yes, this anonymity cherry sure is broken. You will see us teasing him on the other blogs too! 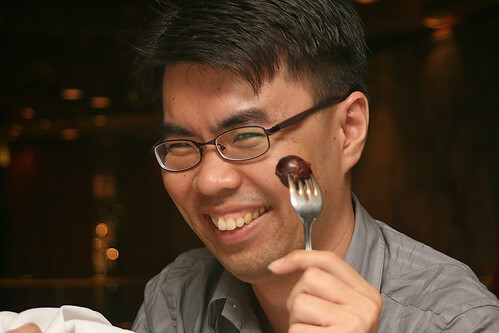 Darren says this keropok's exposed, "lau hong" (gone soft) already! He's funny! 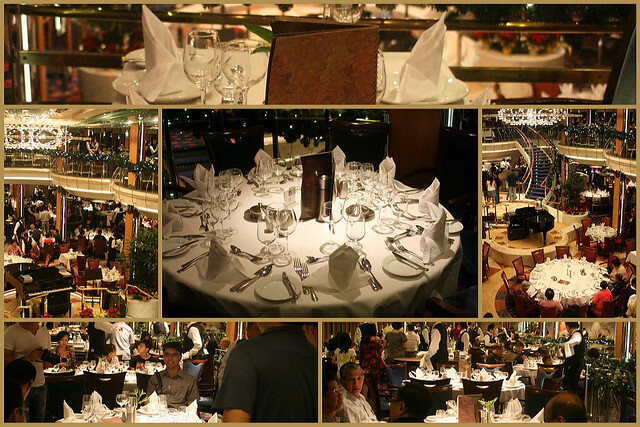 Our team convened 8pm every evening at the two-tier Romeo & Juliet fine-dining hall (also shown in first photo). Swanky, sit-down, full-service dinners. There is a dress code, smart casual at least - no shorts, slippers or tank tops. 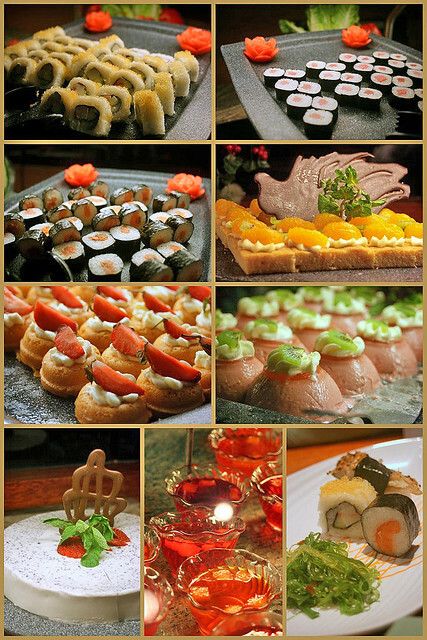 There's no extra charge to dine here; all you need to do is reserve your dining slot. 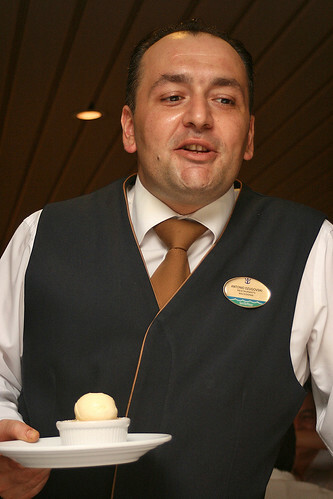 A waiter and assistant waiter are assigned to your table, and they will be the ones in charge of your table each night. You really see many nationalities serving on board. Our waiter Antonio was from Macedonia, and assistant waiter was Dongbiao from China who spoke uncannily good English and served us very well. I'd already gotten word from a fellow foodie (Soundman), who was on the cruise just before ours, that the food was enjoyable. Here's what we had for dinner this Day 1 evening. Poppy seed sundried tomato roll (and there were poppy seed baguette sandwiches at Windjammer too). Oh hurray! 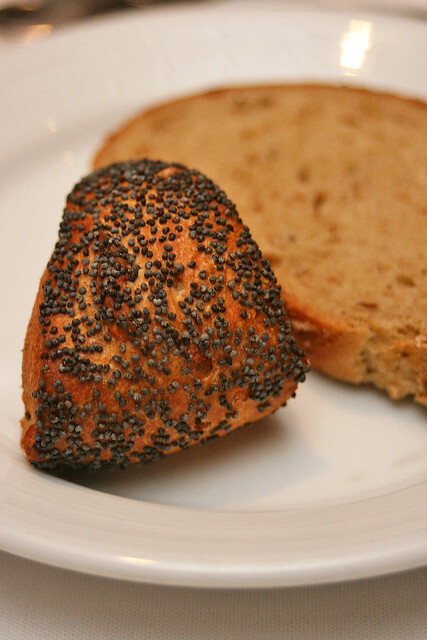 I love poppy seeds! You'd never be able to get this in Singapore - it's banned for its morphine content. It's harmless, really, although if you consume too much, you may actually get false positives for opiates in drug tests. But no, that's not why we were high on the cruise. Being at sea itself is exciting enough! Anyway, you do get a variety of bread rolls, all freshly baked on board daily. 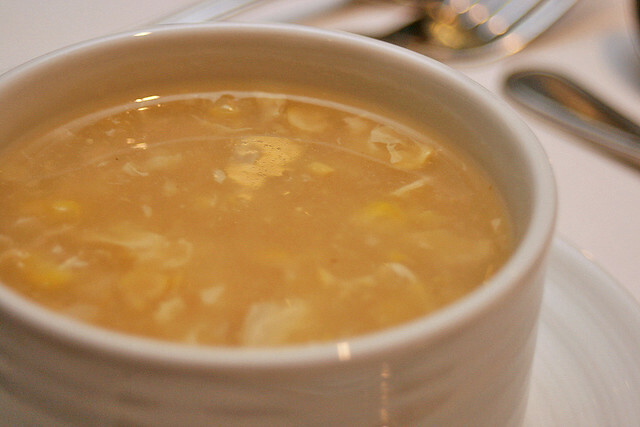 From the starter selection, Sweet Corn Soup, loaded with chicken bites and crabmeat. 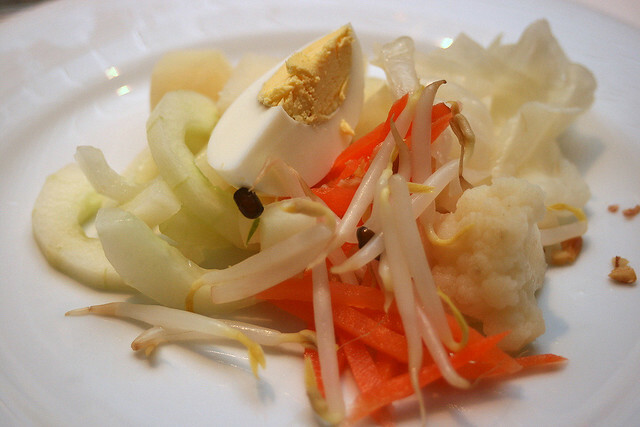 My gado-gado appetiser (before the peanut and sambal oelek sauce). 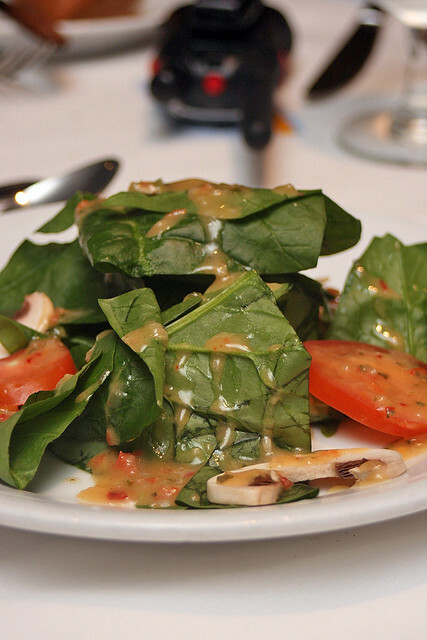 Spinach salad with plum tomatoes, sliced mushrooms and toasted sunflower seeds. And now we come to the mains. The portions are hefty! Windjammer may be the buffet restaurant, but food at Romeo & Juliet is just as freeflow. You can order as many dishes as you like. That's phenomenal! If you don't fancy what you got, try another. Can't decide between dishes? Get both! See what I mean by them pampering and indulging you? When it comes to food, you will be spoiled silly! 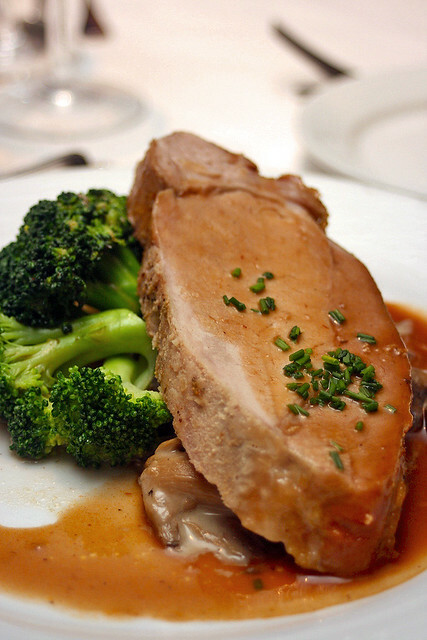 Pan-fried Double Cut Pork Chops, served with Buttery Mashed Potatoes, Broccoli and a savory Forest Mushroom Ragoût. 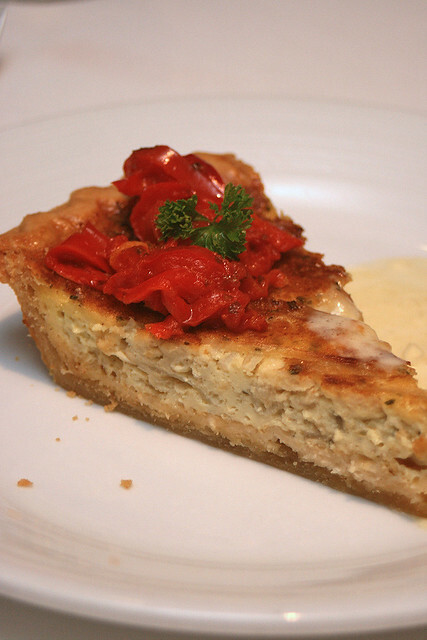 Vidalia Onion Tart: sweet Vidalia onions combined with nutty Gruyère cheese, baked in a buttery crust, served with leek fondue and sauteed red peppers. 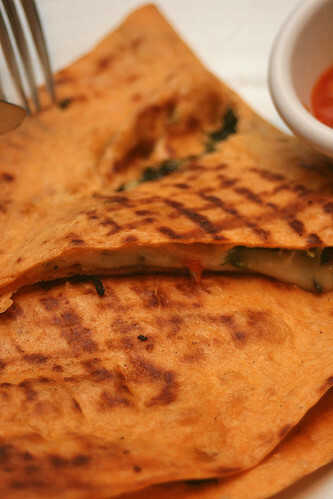 Grilled Mediterranean Quesadillas: Melted Monterey Jack cheese and vegetables sandwiched in warm tortilla; served with a tomato-cilantro salsa. This is vegetarian, and quite tasty according to Mui Yee who ate this. Pan-seared Salmon with black bean sauce and baby bok choy (omitted in my case - I'm a bok choy hater). This was recommended by our waiter. 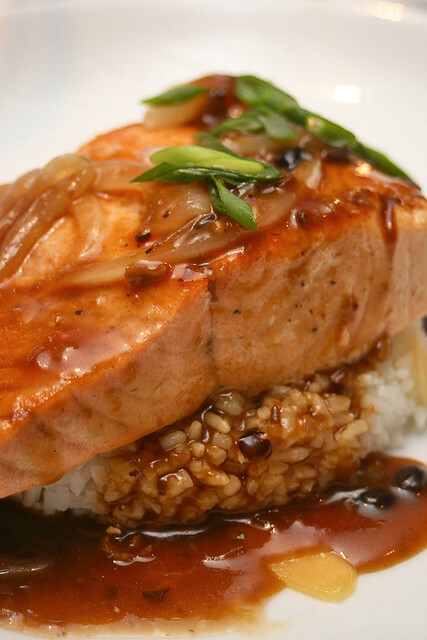 The salmon was done nicely, not too overcooked, and the black bean sauce added a savoury Asian touch. At Romeo & Juliet, they also give you additional sides to share. 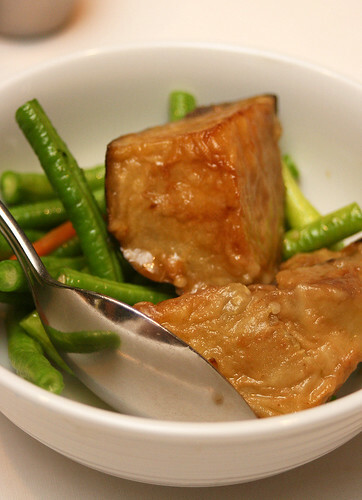 Most often of stir-fried vegetables - very healthy! Here we have long beans, eggplant, and carrots. They also make some mean desserts! This is where you really cannot help but order more than one! 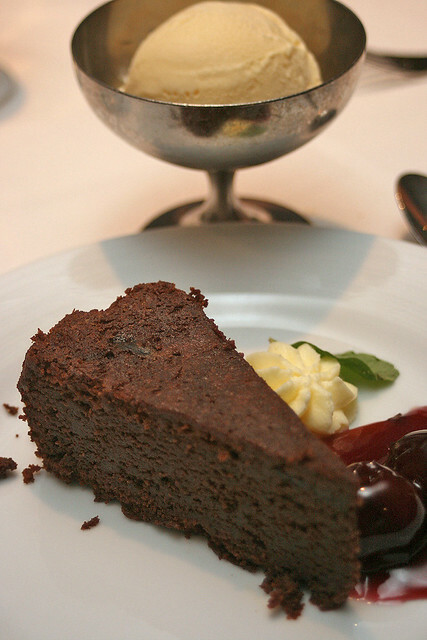 Chocolate Cherry Cake, served with a dollop of Kirsch cream and scoop of vanilla ice cream. Great combination! 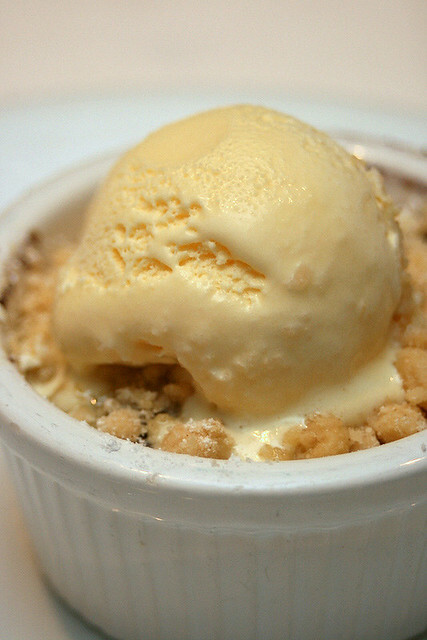 Blueberry and peach crumble with vanilla ice cream. Comfort food! 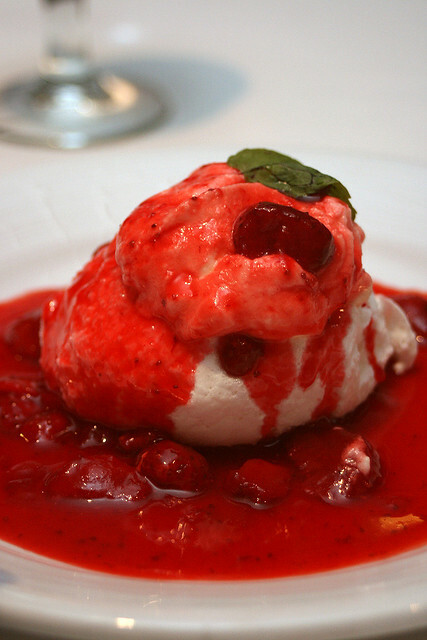 Strawberry pavlova, drizzled all over with compote. You know you want some. 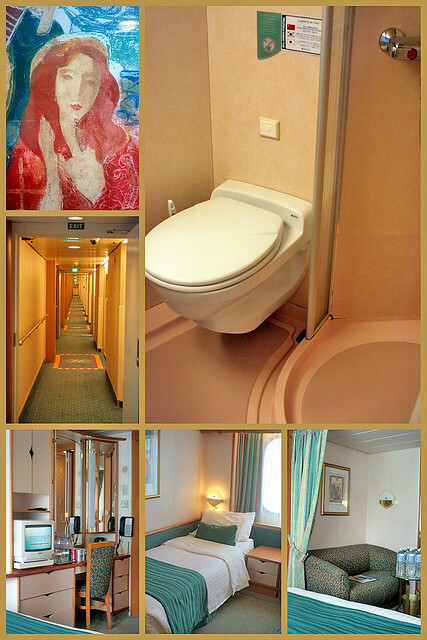 But of course, man does not live by bread alone, so let's see what the other parts of the cruise ship is like. It's really exciting when you first feel the ship move, because if you'd followed the wise advice to board early, you would have already had half a day to explore the ship while it's still docked. Our ship departed 5pm sharp, and moved along at rapid speed. It's sturdy. You don't feel any swaying or rocking, only a slight engine-like vibration at best. At over 70,000 tonnes, the "Legends of the Seas" is a large cruise ship. 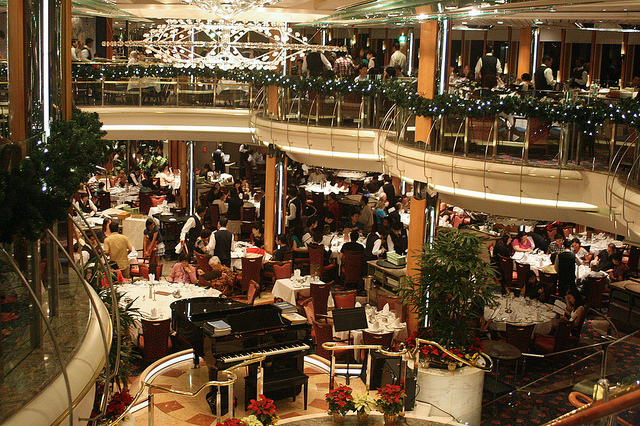 We never felt it was crowded, even though the ship had nearly 2,000 passengers (it can take up to 2074 passengers!). Even the swimming pool and whirlpools aren't jam-packed with people. I suspect they're all too busy eating. I don't blame them. 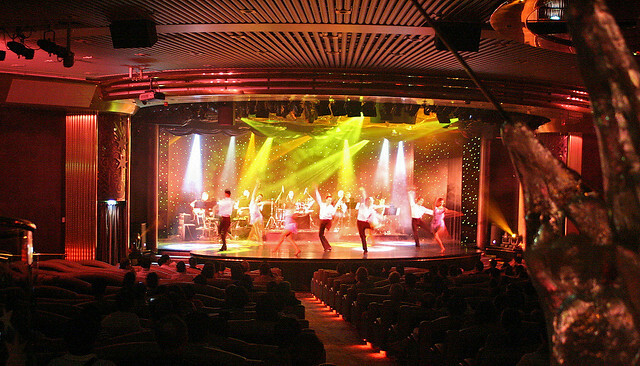 There's plenty of entertainment included in the cruise package, including live shows and performances. Music is always going on somewhere. They also show movies - those new on DVD at this point in time, like Knight and Day, Salt and Inception. I noticed Toy Story 3 also showing in the afternoons. 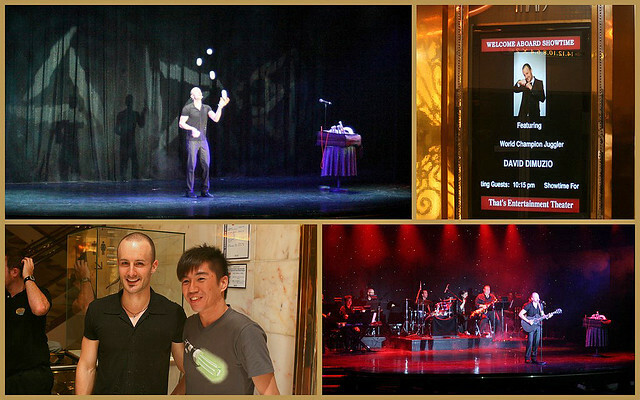 After dinner, we caught world champion juggler David DiMuzio's charming act. It's one of the highlights at the "That's Entertainment" theatre. To be very honest, I wasn't sure how exciting juggling could be? But David wove in so many of his other talents (singing/songwriting/guitar-playing/unicycle-riding) and gave it all a comedic spin. What really blew us away were his covers of Mandarin songs, sung almost tone-perfectly! Here he is singing 月亮代表我的心 (The Moon Represents My Heart). Interestingly, we heard this song a lot all over the ship, and even after we left the ship. Seems this old song is back in vogue? 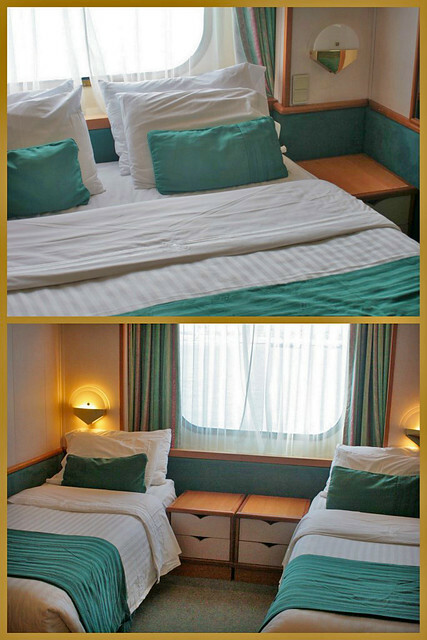 The rooms and facilities are kept assiduously clean. You have a specially assigned housekeeper or room steward, who introduces him/herself to you. And the rooms are cleaned and made up twice a day. I don't even get that at most hotels! And when we got back to our rooms, a surprise awaited on our beds! 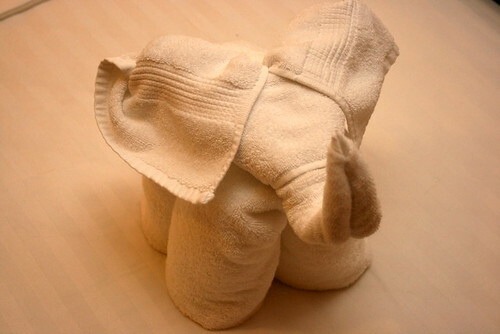 A towel origami pet! And you get a different one each night. What a nice touch! I can't imagine the work that goes on for this - somewhere within the boat, some people are folding 2,000 of these for the guests, daily! The evening soon draws to a close, but even past midnight, there are people out and around enjoying the atmosphere and live bands. 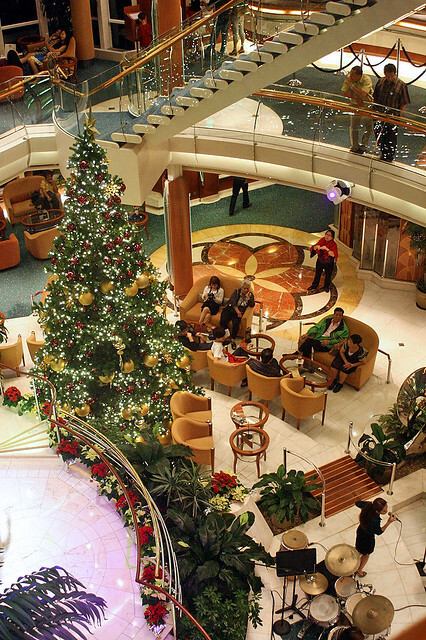 The ship is elegantly decked out for Christmas, and it's lovely to see. Well, this has been a long post, but I have barely covered the tip of the ice berg. Personally, I don't think I'll ever do justice describing the cruise - it has to be something to be experienced yourself. 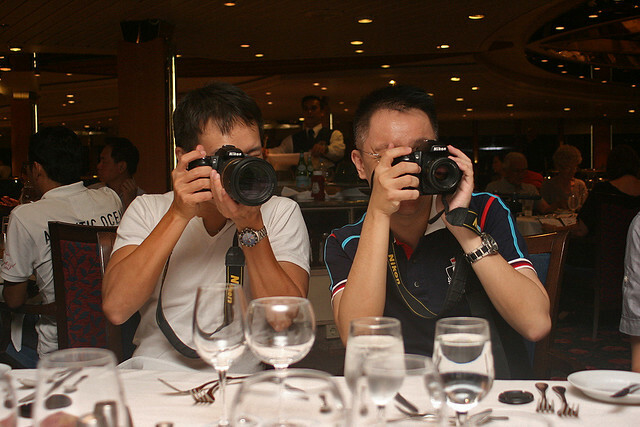 I have at least three more posts coming up, but in the meantime, do head on over to my fellow cruisemates' blogs (all aggregated on Omy.sg's Royal Caribbean minisite) to see their many fascinating photos and perspectives. I love how you send 10 people on the same adventure, and all will report different things! Very enriching and enlightening. While you're on the minisite, you might like to enter the contest to win a set of two luggage pieces (oh man, we really wanted the orange ones!). 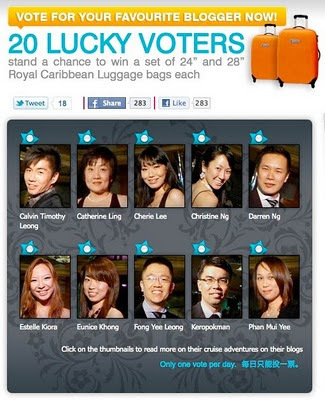 Just vote for your favourite blogger (doesn't have to be me). Do please check out the other bloggers - they have done some praiseworthy posts. Vote the ones you like! You can vote once every day. Non-Singaporeans can vote too (just fill in your passport or any sort of identification number in the NRIC section) but you have to make sure someone can collect the prize on your behalf. Next up: Day 2 - We reach Port Klang and go into Kuala Lumpur on a shore excursion. Keropokman and I catch up with some fellow blogger friends up there! More glorious food! Three Cookies: Thanks! That's a great way of putting it! LFB: Yeah, we're not the privileged few anymore, who know the real Keropokman. And yes, it didn't feel like a competition at all. 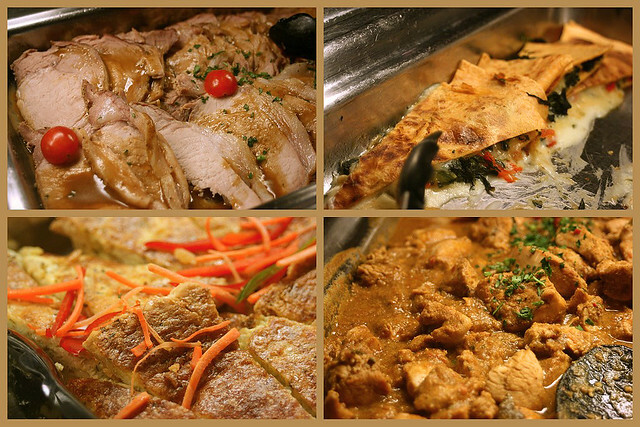 Singaporefoodlover: thanks for sharing your perspective. i m voting for u! cos I love reading your blog! 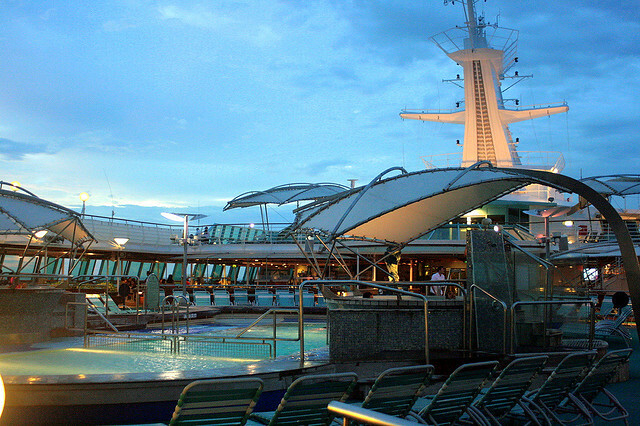 Ciki, this cruise ship's got rock-climbing wall, gym, running track, spa and whirlpools! Anonymous: thank you for your support! Hope you check out the other blogs too. They're great! There's no way someone can resist to all. Not even a model on a diet can resist.